Bintan is one of the Riau Islands of Indonesia. Bintan: the northern tip of the island, Bintan Resorts (Lagoi), 45 minutes from Singapore by ferry, full of expensive resorts and manicured lawns. As it has very little in common with the rest of the island, the resorts are covered in the Bintan Resorts article. Separated from the resorts by checkpoints and armed guards, the rest of the island is "real" border town Indonesia, home to electronics factories, fishing villages and local style resorts (beach and adventure type) along the East Coast Bintan. The colorful town of Bintan, Tanjung Pinang, 1.5 hours away from Singapore by ferry, used to be a local destination for prostitution and gambling (just like neighboring Batam), but after a clamp-down by the local authorities it is regaining its rightful reputation as one of Indonesia's most historical cities, with its ancient vibrant market partly located on stilts in the sea. Bahasa Indonesia, which is spoken throughout Indonesia, is modeled on the version of Malay which originates from Riau on the Sumatra mainland and the Riau Islands. In fact, Riau Malay is regarded as the purest form of the Malay language and visitors from Malaysia will find the Malay spoken here very similar to Bahasa Malaysia, which is the version of Malay spoken back home. English is spoken at Bintan Resorts and, to a lesser extent, the resorts of Trikora, but not much elsewhere. Mandarin is spoken throughout by the Indonesian Chinese. Most of them will understand Chinese's dialect Teochew as well. For detailed information on visas, please see Indonesia page. All Bintan ports, namely Sri Bintan Pura (Tanjung Pinang), Lobam and Bandar Bentan Telani/Lagoi (Bintan Resorts) are visa-free and visa-on-arrival points of entry. As of July 2011 a 7-day visa on arrival at 10 US$ per person is available again for individuals. This visa is valid for visits to the special economic zone of Bintan / Batam / Karimum only. Bintan's Raja Haji Fisabilillah Airport (IATA: TNJ, ICAO: WIDN) only caters to a limited number of flights, none of which are international. The main operator is Riau Airlines which provides connections to Jakarta, Pekanbaru, Palembang, Jambi and the remote Natuna Islands. Sriwijaya Airoffers daily flights from Jakarta. A viable alternative is to fly into neighbouring Batam, which has a larger airport, and taking a ferry across. However, for most foreigners, unless you are coming from Malaysia or elsewhere in Indonesia, the most convenient way to reach Bintan would be to fly into Singapore and take a ferry to Tanjung Pinang. Some of the ferries linking the various Riau Islands at the Tanjung Pinang ferry terminal. You are most likely to arrive by boat. Most international travelers arrive from Singapore and Johor Bahru. Bintan is also the major domestic seaport for the Riau Islands and is a port of call for Indonesia's major passenger shipping company Pelni. The ride across itself (return ticket around S$50) is worth the trip. Make sure you get on the open deck (most locals stay in the air-conditioned cabin). Close to Singapore, hundreds and hundreds of oil tankers, freighters and huge container ships from all over the world literally fill up the horizon in any direction. 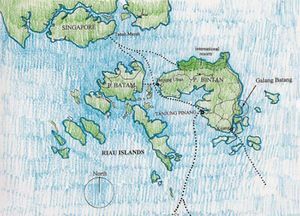 Later on on the ride, there will be small islands dotted across South China Sea, most seem uninhabited, with mysterious jungle coastlines, and dark volcanoes in the background. Just use your imagination and think about the pirates that have been hiding on those islands for centuries (and are still now), or how participants of the "Survivor" TV series would cope on such an island, with huge pythons all over the jungle. There are several passenger ports in Bintan. The most common one is at Tanjung Pinang where most short-distance inter-island ferries and those from Singapore and Johor Bahru dock. The other ferry terminals are at Tanjung Uban, Kijang (where Pelni boats dock), and Teluk Sebung which serves the Bintan Resorts area on the northern part of the island. Please see Bintan Resorts for details to get to that part of Bintan. From/to Singapore - three companies - Sindo, Indo Falcon and Berlian/Wavemaster - operate ferries between Singapore's Tanah Merah Ferry Terminal and Tanjung Pinang. Together, they operate six ferries on weekdays, increasing to nine during weekends and public holidays. Tickets cost around S$50-59 return / S$40 one way (excluding Indonesia port tax). The various ferries from Singapore take around 1:45 min to get to Tanjung Pinang. When you arrive you should confirm your return at the ferry company offices ASAP as the ferries can get full. Bintan Resort ferry:-An easy way to get to Lagoi area from Singapore. Usually if you book a package for any of the resorts, it comes with a this free ticket. You could directly get the ticket also from the [ http://www.brf.com.sg/online booking]. Registration must. From/to Malaysia - around three ferries daily to/from the Johor Bahru International Ferry Terminal at Stulang Laut, Johor Bahru, to Tanjung Pinang. Tickets cost RM85/150 one-way/return excluding taxes (Tax is almost RM 6). Journey takes three hours. When you reach to the Tanjung Pinang ferry terminal before you go other places, at first, you must confirm your return ticket for any time you want. Normally there is three time for ferry, one is morning roughly 7am another one 12:30 am and last one 3:30 pm which normally last one will be canceled due to lack of passenger but they mention, it is because of weather. For confirmation of your return ticket, the agents that are located outside of ferry terminal charge you Indonesian Rupiah 120000 (USD 10)it seems it is normal but it is not fair. Beware once you confirm your ticket the agent must give you the boarding pass card which is small paper and you should keep it. The ferry's air conditioner in most cases are out of control and inside the ferry is too cold specially when it is rain. For more information about ferries schedule call Tenggara Senandung (Tel: +60-7-2211677) at the Johor Bahru ferry terminal for more information. Baruna (Tel: +62-771-28578 in Tanjung Pinang, +62-778-479162 in Telaga Punggur) and Sentosa speedboats run virtually every 15 minutes between Telaga Punggur on the southeastern end of Batam and Tanjung Pinang, the main town on Bintan. The fare is Rp. 40.000 before port taxes of Rp. 3.500 (1 hour). Slightly less frequent speedboats run between Telaga Punggur and Tanjung Uban on the western end of Bintan. Several ferries which originate from cities in the Sumatra mainland also call at https://batamferryterminal.com, the main domestic ferry port on Batam, before continuing to Tanjung Pinang. One such operator is Dumai Express. From/to Dumai, Sumatra - several ferries daily by Dumai Express run to Tanjung Pinang via Sekupang, Batam. Some ferries also stop at Tanjung Balai on Karimun Island. From/to Pekanbaru - SB Kurnia Usaha Baru runs daily ferry to Pekanbaru, departing at 6:30 am. The fare is Rp 220.000 before port tax of Rp 3.500. From/to Tanjung Balai, Karimun Island - daily ferries by Arena to/from Tanjung Pinang. From/to Tanjung Batu, Kundur Island - one daily speedboat operated by SB Giam Mas (Tanjung Batu agent at port, Tel: +62-779-431589) departs daily from Tanjung Batu, the main town on Kundur Island, at 0745 for Tanjung Pinang. The boat returns to Tanjung Batu on the same day, departing Tanjung Pinang at 1200. The boat has scheduled stops at Galang Island and Moro on Sugibawah Island, while unscheduled stops may be made at various little settlements along the way. Journey time is about two and a half hours each way. The fare from Tanjung Batu to Tanjung Pinang and vice-versa is Rp130,000 before port taxes. From/to Singkep Island - ferries Batavia and Superjet run daily between Tanjung Pinang and Dabo on Singkep Island, departing at 11 am. The fare is Rp 105.000 before port tax of Rp 3.500. You can catch boat connections to the Lingga Islands from Singkep. Fortnightly ferry from Tanjung Pinang to the isolated Anambas and Natuna Islands. Pelni's KM Bukit Raya sails from Kijang port in Bintan to Letung, Tarempa. Natuna and Midai on the way out to Pontianak, West Kalimantan. It however returns to Tanjung Pinang via a different route. From/to other parts of Indonesia - PELNI ships link various Indonesian islands with Kijang port on Bintan. These ships provide direct links with Jakarta (KM Ciremiu), Pontianak and other more distant ports. Getting there/away: From outside Kijang harbour there are bemos (public minibuses) going the 26 km to Tanjung Pinang. Public transportation on Bintan is very limited, and is probably not worth the effort unless you have a passable command of Indonesian and a lot of time on your hands. Virtually all visitors use taxis or rent cars. Taxis compete furiously for your custom and cutthroat bargaining is a necessity. The safety of these is dubious though, and it is generally advisable to avoid the taxi touts at Tanjung Pinang's ferry terminal entirely and arrange transportation with your lodgings. Prices about S$35/day (or 20/half a day), fun and convenient way to hop from beach to beach or even travel quite a long distances over the island. They will provide you with a helmet and price of the gasoline is cca Rp10000/2l bottle (every shop near the road sells that). Many roads dont have street lights, so avoid travelling in night. There is no rental shops around. But there are lots of travel agents/ guys around as soon as you get out of the customs. Fix a rate, give him some ID, and you are on your own. The bikes are pretty new and decent condition. One of such guy's number is +6282174984894. Since the bike is private owned, don't know what will happen if you crash it. They accept Singapore dollars also. There are many one way roads, especially in the Tanjung Pinang city. Traffic is crazy in the city, but quite okay in the village areas. Other option is to arrange it from the hotel/resort you stay. But you have to pick up/drop off the bike from the hotel. Bintan's embryonic public transport system consists of white minivans known as mikrolet or angkutan kota (angkut). One set of vans runs around Tanjung Pinang, while another set covers the rest of the island. The only way to tell where they're going is to yell out your destination as they pass, and to get off, just yell kiri. You can transfer between the two near Bintan Centre, also known as Batu Sepuluh (Marker 10). Fares within the city are a fixed Rp. 5000, fares outside it are negotiable; going to Trikora might cost around Rp. 40000. Maitri Graha (Lady of Mercy-Chinese temple)- Chinese temple situated in the midst of a large garden. On the way to Trikora Beach from city.Location: Air Raja, East Tanjungpinang, Tanjung Pinang City, Riau Islands 29125. Trikora Beach- One the two locations where the resorts and water activities located. Lagoi Beach- Resorts and water sports. Untouched beaches can be found in Sumpat. Floating village- Village built in the sea using wooden platform. Not a tourist location, but if you want to see the hard life of poor people in Riau Island. Road is very narrow. Go by walking or by bike, if you are an experienced rider. Location: many places, especially towards the north eas side of the ferry terminal. Eg: , Jalan Pelantar III, Jl. Plantar II. Mount Bintan -Hiking trail, need to hire tour guide. Arrange through hotel. Bintan has excellent beaches, although the water tends to be murky due to its proximity to Singapore, shipping lanes, and Batam's industries. Bintan Resorts is best known for golf, while Trikora is a cheaper option for sea sports. All the water activities are attached to resorts. Options like-Banana boat ride, Kayaking, Kite ride (5 hour class s$ 500, including the rental), Diving, Snorkeling (S$ 35 per person, including the rental and transfer to near by small island) options are available. Usual business hours from 8:00 am to 5:00 pm. You can also go island-hopping from the main ports. From Tanjung Pinang, going to a nearby island would only be about S$5-10. The local wooden handicrafts are worth buying, if you're on the lookout for a souvenir or two. The prices are generally cheap if you can find the right places to buy from. The resorts use Singapore dollars as their de facto currency, but while they're accepted elsewhere on the island as well, exchange rates may not be in your favour and you'll usually be better off using rupiah. Prices on the "Indonesian" part of the island are on par with or slightly higher than other islands in Indonesia, while the price level on Bintan Resorts is quite expensive even by Singapore standards. The major shopping centres in town, like Ramayana Mall or Bintan Mall, hardly compare to those in Singapore, Jakarta, or Kuala Lumpur, but the items sold are generally cheap, varied, and of acceptable quality. Seafood in Bintan is fresh and affordable (about S$3-7/pax) and Tanjung Pinang has many restaurants, although they usually have sub-standard fans and minimal or gaudy decoration. However, service is good and waiters are friendly. There isn't always an English menu, so take a look at the Indonesian phrasebook and learn the basics. Also remember that 'vegetarian' is defined differently here than other parts of the world, so if you are a strict vegetarian, make sure you mention no meat is to be included. Hygiene may be a problem, but restaurants here depend on repeat customers, so generally they will do their best to make sure you have an enjoyable experience. Sam's Anna seafood restaurant- excellent location for a relaxed lunch/dinner in Tanjung Pinang area. Sea front, open deck restaurant with awesome breeze. Food taste is fine. But quantity is bit less. Place is suitable for events like wedding. Need a transportation to reach. Owner speaks good english. Bintan Laguna restaurant and resort- One of the very few place where you can have food on platform in sea. excellent location, good food, extremely friendly staff. Having a beer in the sea platform feels like heaven. Food is bit pricy. You can arrange tours and sight seeing in the reception too. Bintan Bukit Kursi Resort. 1 hour drive from town, it is a collection of comfortable rooms with beach view, very comfortable and private houses. Rooms are fully air-conditioned, spacious and clean. Approx USD$30 per room, fits 2-3. For the adventurous tourist who wants to see a different side of Bintan, and not the normal commercialised places. +65 96356931 (Singapore line), +62 8127065970 (Indonesia line). Putri Pandan Resort  is a friendly locally owned establishment. A comfortable but basic bungalow operation opened 2009. It is on the north of the island to the far east. The fan only rooms are clean and with surprisingly modern (if sparse) furniture and en-suites. (All bungalows are "semi-detached" - the adjoining walls are not that soundproof!). All rooms have large "picture windows" and are directly on the beach facing a small island. The clear, shallow sea comes right up to the bungalows at high tide, retreating out past the island at low - allowing you to walk the (approx) 1km to the island. Electricity is at night only (generator). No internet as yet. Food is good but basic. The "Resort" is very remote and a motorbike (for hire there) or car is needed to go anywhere else. Sandflies can be an issue. Ferry from/to Singapore (2hrs - Tanah Merah Ferry Terminal), transfers (45mins) can be arranged via the resort. Nirwana Gardens Bintan Resort is nestled away in the northern coast of Bintan. A family-friendly environment with multitude options for parents to keep their children entertained, relax with their spouses and enjoy all the natural outdoors. Ferry from/to Singapore (2hrs - Tanah Merah Ferry Terminal), free 2-way transfers (25mins) are provided from the resort (fixed timings). The resort is self-sufficient with its own seafood restaurant - The Kelong. There are also a myriad of activities that guests can engage in e.g. shooting, archery, flying fox and paintball at the Bintan Resort Centre. Drink bottled water. Except for a few 4/5* hotels, tap water is generally not potable. Fresh tender coconut water may be available at a few places, if not at your own resort. As the locals are generally Muslims and thus do not usually drink alcoholic beverages, beer and wines are not available in every shop, but major shopping centres/hotel concierges can tell you where to buy them. While better than it used to be, Tanjung Pinang has a partly deserved bad reputation. Do not carry large quantities of cash or flash it about, and do not take unfamiliar taxis (particularly the touts at the jetty). Locals will readily befriend you, but be warned, they will inflate your bills and take a cut. However, since the cut they take isn't very large unless they are really unscrupulous so they still make good, friendly, and knowledgeable guides.